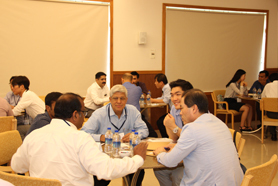 Kochi : In an event marked with high level enthusiasm, Rajagiri Centre for Business Studies (RCBS) hosted a South Korean delegation of 31 entrepreneurs, 11 professors and 12 students who were on a visit to Kerala exploring business opportunities in areas of engineering, food, chemicals and textiles among others. 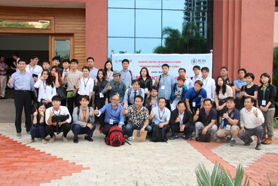 Held at RCBS’ Rajagiri Valley campus on Wednesday (November 19, 2014), the event was coordinated by Youngsan University, South Korea. The meeting witnessed a host of Indian entrepreneurs and professionals from various industries showing interest in all the avenues highlighted. Representatives of V-Guard, SFS Constructions, Synthite, Samudra Shipyard, Vajra Rubber Products, Tierra Food, to name a few, who interacted with the Korean delegates expressed their intention to take it forward. From the Korean side, Gerlin Co., a leader in construction and interiors; Aspec Co., an expert in control consoles and main switchboards; Samsung Cold Storage Co. specialized in cold storage of frozen fish were amongst the thirty-one business enterprises that took part in the meet. While the Indian counterparts were content with the various business opportunities showcased, the Korean delegates expressed satisfaction and confidence in the growth of Indian industry in various spectrums of businesses in the robust and investment-friendly economy of India. The participants were unanimous in applauding the organization of the event which they felt will open the many doors of opportunities in the days to come.